Flooring One epitomises the vast, multifaceted realm of carpets, offering sumptuous deep piles, scintillating textures, timeless traditional styles and patterns and trend-setting modern designs. Whatever style or colour scheme you're seeking, you'll find something fitting in Flooring One's superb range of carpets and rugs. 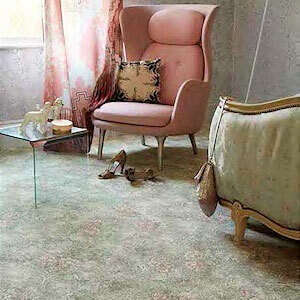 Flooring One carpets - made from lush British and New Zealand wool blends - are varied, fashionable and attention-grabbing, some boasting innovative stain-resistant and waterproof finishes. This makes a lot of Flooring One carpets perfect for homes with children. Vale Furnishers has a dedicated flooring department, with carpets, rugs, laminate, vinyl and wood floors available not just from Flooring One, but from other leading floor brands like Axminster and Parador. Our prestigious range of Flooring One carpets and rugs includes some of Flooring One's most inventive floor designs, textures and finishes.